I do not have the statistics handy, but just like when you are about to eat bread and butter, and the slice of bread almost systematically falls on the floor on the buttery side, I would bet you that the one time you forgot money in your pair of jeans was the time you decided it was time for a wash, and threw the pair in the washing machine. The result? A wrinkly, mushy piece of paper that no shop in the high street would accept. If it is not too bad, and you can still tell it used to be a banknote, you can try taking the money back to your bank, to be exchanged for a crisp new note, but sometimes even the bank won’t have your tenner back, and there is nothing more frustrating than losing your hard earned money! Well fear no more, as the Bank of England is about to introduce polymer banknotes! Those plastic notes have been used all around the globe for a few decades now, from Samoa to Guatemala, making the life of the forgetful jean washers much easier. 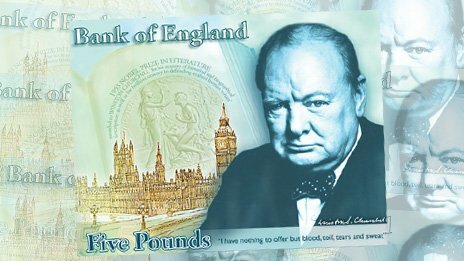 Britain will soon follow, as the £5 note, bearing the portrait of Sir Winston Churchill, will be produced in 2016, while a plastic £10 note with a picture of Jane Austen will be made a year later. As a government, making plastic banknotes is a smart move, as it prolongs the life of the note, making it cheaper to keep change circulating. It is not only the washing machine’s fault, paper notes can tear after too many folds, while plastic lasts longer. 2.5 longer to be exact, so even if they are a bit more expensive to produce, it will be cheaper for the bank in the long run. They will still melt if you try to iron your jeans after you washed them, but come on, when does that happen? According to the Bank of England, plastic notes are also cleaner. I would still wash my hands after handling cash as I usually do, but I can imagine that plastic doesn’t get as greasy and absorbent as paper. And as we just mentioned, you can wash them with your dirty clothes! Another point in favour of plastic banknotes is that they allow for more security features, making them harder to counterfeit. I find it fascinating to see how quick money is evolving, and how we use it. Being able to use the same currency in several countries, like the Eurozone, or the dollar in some countries outsides the U.S., using virtual currencies like BitCoins made of thin air, using a credit card to pay for a purchase on the other side of the globe… Plastic banknotes are one step further, but I can imagine that someday, we would go completely cashless. That today you may swipe your American Express, and tomorrow, you may be asked for pupil or fingerprint recognition instead. At the moment, I always favour credit cards over cash. It is clean, all your expenses are neatly summarized in your statement, and you earn points or other perks like purchase protection for using them. As long as you are being smart and paying your balance in full, they only provide convenience and advantages. But tomorrow? I can’t wait to see what can be invented.